A man who asked police to remove his mugshot from a wanted appeal because it was unflattering has been sentenced for assault. South Wales Police posted the photo of Wayne Esmonde, 35, from Swansea, on social media when he was wanted for attacking his then-partner. 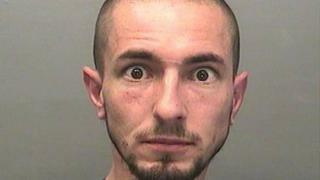 He had an eight month sentence suspended for 18 months after pleading guilty at the city's crown court. The court heard he head butted and threw a bottle at his victim. He had written on the force's Facebook page: "I am him. Not a very flattering mugshot. "I'd appreciate it if you'd take this post down. Innocent until proven guilty and all that." The court heard on Monday how he accused his then-partner of cheating, pushed her off a doorstep and on to the ground before carrying out the attack. Prosecutor Janet Gedrych said he had previously admitted a harassment charge and was subject to a three-year restraining order.